Last week newly elected Governor Gavin Newsom rolled out his proposed budget in charismatic fashion with a daring and engaging 2 hour long press conference. 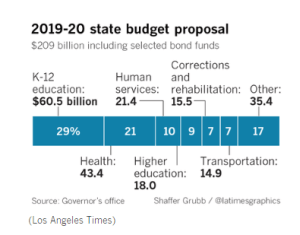 Not only is the Governor proposing a close to an $8 Billion increase over the year before, and his predecessor Jerry Brown, but the core of his new spending will focus on: increasing the housing supply, providing for additional healthcare benefits, and significant investments to address the state’s crisis levels of homelessness. 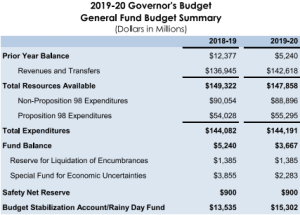 Additionally, the Governor hopes to offer a one time cash infusion to the State’s under performing CALPers fund, to shore up the looking pension crisis that has been plaguing the financial planning of local governments. anning funds to local governments to adopt more forward thinking zoning and special districts (roughly $750 million), streamlined approval processes for specific types of housing–specifically housing for those experiencing homelessness–but also by passing legislation like SB50 (which you can learn more about by clicking here), and by adding teeth to some long standing planning processes that are currently inconsequential for local governments who are not building enough. Not to mention that an additional $500 million will go to communities that reach their housing production goals and can be used for general purposes. On this last point specifically, Newsom is calling for SB1 transportation funds to be withheld from jurisdictions that are currently not meeting their RHNA (Regional Housing Needs Allocation) requirements, as documented in local housing elements. For reference, as of 2017, there wasn’t a single jurisdiction in urban or coastal California that had met its housing development goals as outlined in their housing elements— mostly because they had not built enough housing for lower income levels. That is very likely to change, as these same jurisdictions are the ones most in need of new additional transportation funding. d to launch frivolous lawsuits against projects that neighbors don’t like being built near them. (To see a local example of such a frivolous, and most certainly doomed lawsuit against an otherwise beneficial housing project, look no further than the Santa Cruz Sierra Club’s recent attempt to delay the Pacific and Laurel project that was approved last December). To see CEQA reformed mentioned at all, even in the context of reducing homelessness, may be an indication that more reforms could be on the way, paving the way for faster approvals. Beyond the Governor’s housing agenda, he is proposing multiple one time expenditures that would help shore up the State’s pension system, allow undocumented residents to stay on Medi-Cal until 26 years of age, and even bringing back the individual mandate for health insurance coverage. 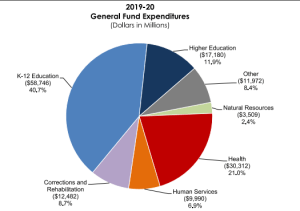 You can read more about the specifics of the proposed budget (definitely subject to the whims of the legislature) below, and visit the new budget webpage that was set up by Newsom’s office here.